Subacromial impingement is a condition that causes pain in the shoulder and upper arm. It happens when the tendons of the shoulder joint are strained or injured, or when a spur of bone develops under a flat bone found at the top of your shoulder blade, called the acromion. Either of these conditions can result in the inflammation, pinching or rubbing of any of four tendons (known as the rotator cuff) against the acromion. When this happens it is known as impingement. The exact cause of subacromial impingement is not known. Some people may be more susceptible to a wear-and-tear process in the tendon, where it can start to fray or split. It can occur spontaneously with no apparent cause or due to the result of minor injury, although it is often triggered by subjecting the shoulder to repetitive overhead activities. Age may be a factor in the onset of subacromial impingement, since bone spurs can develop as you get older. The rotator cuff group of tendons is also more prone to strains and tears with increasing age, and is most common in people over the age of 40. In younger people impingement can often be caused by shoulder instability (such as dislocation). The shape of the acromion can also make some people more susceptible to the development of subacromial impingement. Extremely common. Subacromial impingement is the most common problem of the shoulder. It is thought that as many as 20% of all people will have symptoms at some time. The most common symptom is pain. This is most frequently felt over the front of the shoulder and on the outside of the upper arm. A classic presentation is of a painful arc on movement when the arm is lifted out to the side and up to your ear. You may also feel pain when trying to complete "normal" movements, such as putting on a coat or a jacket. Some people report significant pain at night, which can interrupt their sleep. Others often describe a "locking" sensation in their arm when attempting certain movements. Mr. Cole will talk to you about your shoulder symptoms and your shoulder's history. He will examine your shoulder and assess your range of movement. He will see if you have a painful arc. There are specific clinical tests to suggest impingement and Mr. Cole will also test your rotator cuff tendons and strength. An x-ray can provide an excellent “picture" of bones and joints and will show if your shoulder has developed any bone spurs. X-rays are not, however, very good at showing ligaments, tendons or muscles. It is useful to look for some causes of impingement such as calcific tendonitis, subacromial spurs and arthritis of the ACJ. If Mr. Cole suspects that your tendon is torn, he will request an ultrasound scan or an MRI (Magnetic Resonance Image). Both of these scans show the tendons and can highlight any damaged areas. MRI stands for Magnetic Resonance Imaging. It uses a powerful magnet to obtain three dimensional pictures of body structures. Like ultrasound, it is a non-invasive and painless procedure. Most treatment for subacromial impingement is non-surgical, although a small proportion of people require an operation. This is usually only when your shoulder has not responded to non-surgical treatment. Pain medication and anti-inflammatory medicines will help to ease your symptoms of pain and stiffness. If your symptoms are mild, this may be enough to keep your condition manageable. These are given to the bursa in the subacromial space. This is a fluid filled sac located between the acromion and the rotator cuff tendons. It allows for the smooth gliding of the rotator cuff under the acromion with overhead movements of the shoulder. The injection is usually a mixture of local anaesthetic and steroid and will help to reduce inflammation in the area. Although you may feel increased pain for the first 24 hours, injections can be highly effective. Mr. Cole will not generally want to give you more than three injections into the same shoulder during one year, however. If your symptoms repeatedly return, he may suggest another treatment option to you. An individual programme of exercises will be devised for you. These may include exercises to strengthen the muscles around your shoulder blade, improve your posture, strengthen your rotator cuff and other stretching exercises. Although the exercises may at times be hard work, tight or uncomfortable, they should not be painful. If you are unable to carry out any form of exercise because of pain, your physiotherapist may suggest other non-invasive and painless treatments such as ultrasound. There is a lot that you can do to help alleviate the pain and promote healing in your shoulder. Resting your shoulder is an excellent place to start. If you can reduce the stress on your tendons, they can begin to heal themselves and the inflammation can begin to subside. Try to avoid the activity that causes you pain or find other ways of doing it. For example, if you frequently need to lift things above head height, use a stepladder so that you do not need to raise your arms. You could also try sitting with your arm by your side, with the elbow propped on an arm rest. This will help to keep your shoulder up and will minimise any impingement. Should you need surgery, Mr. Cole will advise you on what type of treatment would best suit you and your situation. He will choose the most appropriate and least invasive for you. If your symptoms are not alleviated by non-surgical procedures, Mr. Cole may suggest you have an operation known as subacromial decompression. This is done by keyhole surgery (arthroscopy) and is normally completed as day surgery (where you can go home on the same day). The operation involves removing any bone spurs or prominence on the underside of the acromion bone, so that there is a larger subacromial space and less opportunity for tendons to become pinched. If your rotator cuff muscle is torn, Mr. Cole may be able to repair it as part of the same procedure. The shoulder is a ball and socket joint with a ligament above it forming an arch. The ligament attaches to bony prominences (the "acromion" and "coracoid") on your shoulder blade. The shoulder joint is surrounded by a deep layer of tendons (the rotator cuff) which pass under the arch. One of these tendons (supraspinatus) commonly becomes worn and painful. It may swell and rub on the bone and ligament above. The bone then may respond to the rubbing and form a spur. See diagram below. Arthroscopic subacromial decompression is the name of the procedure used to treat conditions such as subacromial impingement. The operation is done by keyhole surgery (arthroscopy – in which a miniature camera is used). It is minimally invasive and you should normally be able to go home on the same day as your operation. 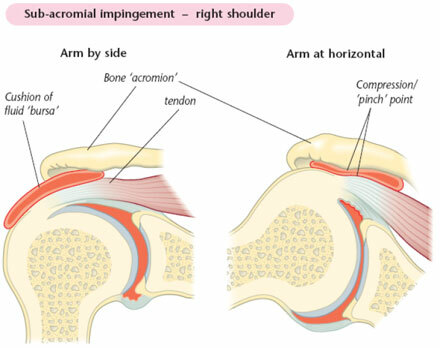 Subacromial decompression involves releasing the ligament from the front of the acromion (a flat bone located on the top of your shoulder) and trimming off the undersurface of the acromion bone. This allows the tendon to move more freely, which in turn breaks the cycle of rubbing and swelling. Arthroscopic subacromial decompression can usually be performed as day surgery. This means that you won't normally have to stay overnight in hospital. However, you may feel more comfortable if you bring your own dressing gown, slippers and toiletries. It is likely that you will be having a general anaesthetic as well as a local anaesthetic block to numb the arm completely. Whilst it is unlikely that you will feel unwell after your anaesthetic you will need to arrange for someone to take you home. It is important that you don't eat or drink anything for at least six hours prior to your admission into hospital, although you may drink water up to two hours prior to admission. The operation is carried out under a general anaesthetic and an interscalene block. After your admission, you may be given a pre-med. This is usually in tablet or liquid form. It will help you relax. A local anaesthetic gel will numb the area, normally on the back of your hand, where the general anaesthetic may be administered via an injection. You will be given an interscalene nerve block during the operation. This acts as an excellent pain relief and for a short while after your operation your shoulder and arm may feel numb. When this wears off, your shoulder can feel more uncomfortable. You will be given some painkillers to take after the operation. When you begin to feel the sensation returning to your shoulder (often a "pins and needles" feeling), you should start taking the pain medication that you have been given. Don't wait for your shoulder to start hurting, as pain is best managed before it gets acute. To keep the pain under control, use your medication regularly to begin with. After a couple of days, you can begin to lower the amount you take and then cease the medication altogether once any pain has subsided. If the pain does not seem to get better, or if you need more pain medication, please contact Mr. Cole. Complications relating to the anaesthetic such as sickness and nausea or, more rarely, cardiac, respiratory or neurological issues (less than 1% each i.e. less than one person out of one hundred). Infection. These are usually superficial wound problems. Occasionally deep infection may occur many months after the operation (much less than 1%). Persistent pain or stiffness in or around the shoulder (5– 10% of patients could still have some symptoms after the operation, these can take several months to resolve). Damage to the nerves and blood vessels around the shoulder (much less than 1%). The need to re-do the surgery is rare. In less than 5% of cases, further surgery is needed within 10 years. Please discuss these issues with Mr. Cole if you would like further information concerning the risks of surgery. After about 2-4 weeks you will be asked to return so that Mr. Cole can check on your progress following your operation. Your wounds will be examined and Mr. Cole will check on your range of motion to ensure that you are not getting stiff. You may discuss any concerns you have during this appointment. Alternatively, should you have a concern, you may telephone Mr. Cole's clinic at any time following your operation. Arthroscopic subacromial decompression is completed by keyhole surgery. This means you will only have two to three small puncture wounds. You will not have any stitches, only small sticking plaster strips. Keep the wounds dry until they are healed, which is normally within five to seven days. You can wash or shower and use ice packs, but protect the wounds with waterproof dressings which will be provided to you on your discharge. Avoid using spray deodorant, talcum powder or perfumes near or on the wounds until they are well healed. You will be given a sling to wear immediately following the operation. This is for your comfort and can be discarded within a few days. You can take the sling on and off as you wish, although you might find it more comfortable to wear your sling at night. Different people recover at different rates. However, by about three weeks following your operation you should find that movement below shoulder height becomes more comfortable. You should also be able to move your arm into most positions, including above shoulder height, although this might still be a little painful. By three months you should feel a lot better, although it can take from six to nine months to fully recover. You will continue to improve for up to a year following the procedure. There are no restrictions (other than the pain). Start moving the arm as much as you can and gradually it should become much less painful. Avoid heavy lifting for the first 4 weeks. You need to be aware that activities at or above shoulder height stress the area that has been operated on. Try not to do these activities unnecessarily. Try to keep your arm in a range of movement which is not overly painful. You may begin driving one week after your operation or when you feel comfortable. Check you can manage all the controls and it is advisable to start with short journeys. The best time for you to return to work depends on how you feel following the operation and on the type of work you do. If your job is largely sedentary with minimal arm movements close to your body, you may be able to return within a week. Most people are able to return to work within a month at most. However, if you have a heavy lifting job or one with sustained overhead arm movements you may require a longer period of rehabilitation. It is best to discuss this with Mr. Cole and with your physiotherapy team. Use pain-killers, ice packs or both to reduce any pain before you begin exercise. It is better to do short frequent sessions of physiotherapy several times a day, rather than one long session. Aim to exercise for five to ten minutes, four times a day. It is normal for you to feel aching, discomfort or stretching sensations when doing these exercises. However, if you experience intense or lasting pain (such as pain that lasts for more than 30 minutes) you should change the exercise by doing it less forcefully or less often. 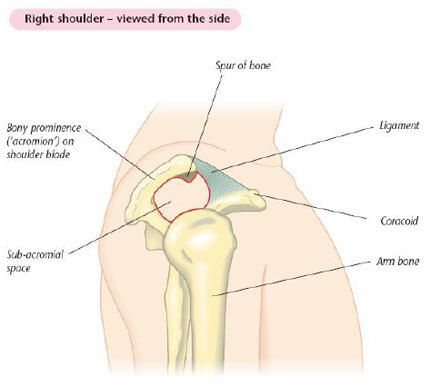 I would like to thank Professor Carr and Jane Moser of the Oxford Shoulder and Elbow Clinic for allowing us to reproduce some of this text and illustrations from their patient information.